Capax Technologies Inc. specializes in designing and manufacturing high quality, single and multilayered capacitors for the demanding requirements of commercial and military RF and Microwave applications. Capax Technologies uses the purest and finest quality ceramic and metallic raw materials and state-of-the-art processes. High precision, automated and manual test equipment and procedures assure superior product quality, performance, and reliability for even the most sensitive applications. The up-to-date design and manufacturing facility offers a modern, controlled production environment, allowing Capax Technologies to maintain its goal of offering high quality products that are certified to be in full compliance with military specifications MIL-I-45208A and ISO 9002. 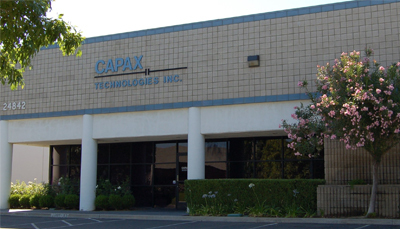 Capax Technologies Inc. is located in Southern California and has over twenty years of experience in supplying our customers with superior, standard or customized, technological solutions to fit individualized needs. © 2006 Capax Technologies, Inc. All rights reserved.